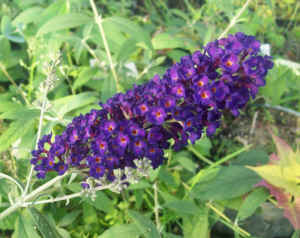 Bloom Time and Color: Dark purple flowers summer through fall. 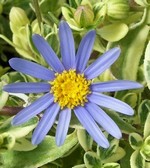 Description: Perennial. 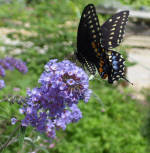 The Black Knight butterfly bush variety is a great nectar source to attract butterflies with. It is the darkest flowered of all the buddleias, almost a grape-violet, and always one of the most popular. This plant is awesome in front of gold foliaged plants. 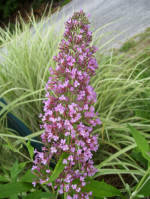 The smaller foliage and shorter stature give Black Knight the effect of being more graceful and airy. Grows 15ft by 10ft. 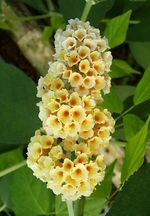 Care: Keep faded flowers cut off bush regularly to keep it blooming throughout the summer. 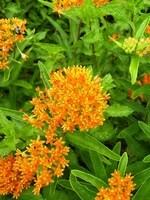 This plant blooms on new growth and should be pruned back near the ground in spring.